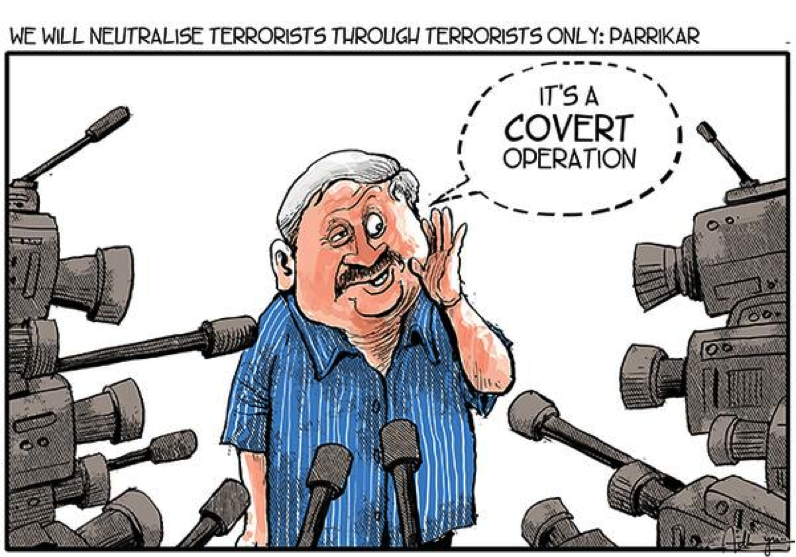 While attending a function in New Delhi On May 21st, India’s Defence Minister Manohar Parrikar said ‘You have to neutralise terrorists through terrorists’. He was referring to the threats to Indian national security from an alleged Pakistan sponsored proxy war. It was a profound statement, as it came from a defence minister of a right-wing nationalist government that came into power with an absolute majority riding on the election promises of giving a befitting reply to provocations originating in Pakistan. After being in power for one year, when its efforts to fulfil other election promises on issues such as inflation, corruption, black money, cleanliness (amongst others) have not met expectations, political analysts may see this as Bharatiya Janata Party’s (BJP) attempt to rally the masses to make up for its dwindling popularity. Operationally, it can also be seen as intent to utilise the only ‘offensive’ options left with India, now that the space for conflict within the nuclear and conventional part of the spectrum in South Asia has become virtually unavailable. With all other doors of ‘pro-action’ or ‘pre-emption’ closed for the belligerent minds in India, this was bound to happen. 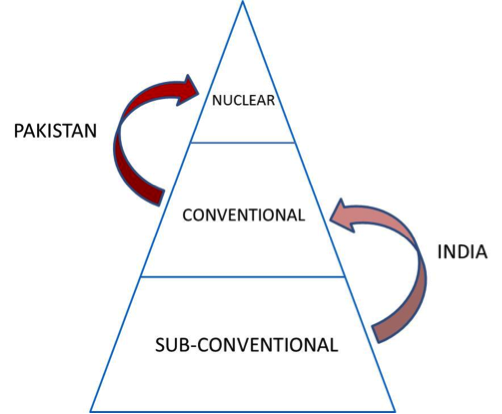 The conflict terrain in South Asia can be visualised at three different levels: nuclear – both India and Pakistan are overt nuclear powers; conventional – both have fought four conventional wars; and sub-conventional – both accuse each other of sponsoring terrorism and insurgencies within their territory. However, the lines that should make a clear distinction between the three forms of conflict are blurred. This is due to the escalation postures adopted by both India and Pakistan, which are asymmetric in nature. In the contemporary era, on more than one occasion, India has threatened with (and even mobilised) its conventional forces to compel Pakistan to stop supporting and sponsoring the militant groups that have carried out attacks in India. This is the threat of a conventional response to a sub-conventional (proxy) war. Exercise Brasstacks in 1986-87 and Operation Parakaram (Twin Peak crisis) in 2001-02 are two such examples. Similarly, after becoming an overt nuclear power in 1998, Pakistan has been quick to adopt a declared ‘first use’ nuclear policy with emphasis on the use of tactical nuclear weapons, in order to deter an Indian conventional offensive – threat of a nuclear response to a conventional attack. The Kargil War of 1999 was the last limited conventional war in which the two nations fought against each other. While Pakistan believed that the presence of nuclear weapons as well as the favourable tactical positions occupied by its soldiers would negate the chances of an Indian response (and force it to accept a fait accompli), Indian military commanders believed that limited space existed under the nuclear threshold, which they were willing to exploit, if their efforts to recapture the Kargil heights had failed. With this mind-set, India prepared and validated a limited war doctrine ‘Cold Start’ in the years that followed. The primary aim of this doctrine was to carry out shallow strikes into Pakistani territory, draw Pakistani military into battle and destroy it and yet prevent escalation. In turn, Pakistani military used this pretext to increase the production of tactical nuclear weapons and short range nuclear capable missiles both of which were heavily publicised. However, in the recent years Indian leadership, especially under the previous government, has played down its reliance on ‘Cold Start’ as a response. Besides, scholars such as Walter C Ladwig III have pointed out that there are inherent flaws related to command & control and objective selection in the doctrine. In addition to that, the proximity of Pakistani cities to the international border combined with Cold Start’s reliance on speed, surprise and deception, diminishes its ability to prevent escalation. The number of options available to India to ‘deter’ Pakistan from waging a proxy war has reduced in recent history. With a strong right-wing government in power India does not want to give an impression of a helpless and paralysed state that has run out of options to deal with its adversaries. This could be the genesis of the statement given by the defence minister. There is no doubt that the use of terrorism to pursue a strategic objective (national aim/foreign policy), is tabooed in the international environment. Well, so is the use of nuclear weapons. But nuclear deterrence has worked, at least so far. And now we are witnessing ‘deterrence’ being applied within the sub-conventional level of conflict, as explained in the following paragraphs. It is clear that any kind of nuclear exchange in the region will be devastating. And hence India will not pursue any option that is escalatory in nature. Besides the existence and devastating nature of nuclear weapons, a quick international (superpower) intervention will not allow this. This is precisely the purpose nuclear weapons serve for Pakistan. They are used as a leverage to seek a quick international intervention during a conflict with India. This is also evident from the fact that as soon as the conflict environment gets hot, Pakistani leaders start nuclear rattling which is adequately hyped in the media so that message goes around quickly and clearly. Nuclear ‘threat’ is used time and again to ‘remind’ India that any kind of reaction may lead to escalation which will be disastrous for India’s national interest. The Indian defence minister’s statement can also be seen as an effort to apply the same template within the sub-conventional level – a ‘threat’ to employ one of the few remaining pro-active strategies to deter Pakistan’s proxy war. It is statement of intent, trying to remind Pakistan about its Achilles’ heel which is now easily targetable, given the fact that the militant groups that have taken up arms against the state of Pakistan are easily recognisable. No wonder his declaration of a covert action was not so covert. It is also important to note how this statement is likely to be perceived across the border in Pakistan. While it is aimed at neutralising terrorists and their leaders (albeit in an unorthodox way), the military establishment, whose hold on power and authority thrives from the ‘Indian threat’ will propagate it as an ‘existential threat to Pakistan’ and exploit it to its own advantage domestically. The recent statements given by Pakistan’s National Security Adviser Sartaj Aziz and Defence Minister Kwaja Asif support this argument. Instead of strengthening the police and the rangers, who are mandated to deal with terrorism and other internal security issues, the military will resort to consolidate its own hold on power by diverting the necessary resources (including foreign aid) towards itself. Meanwhile, a reaction from the Islamist fundamentalists is still awaited. Pakistani leadership often points at the Indian intelligence agencies’ involvement in the terrorist attacks within Pakistan, but so far they have failed to produce any credible proof. This leads us to the following conclusions. Either India is actually involved and the absence of any proof shows that Indian intelligence agencies have been doing a very good job erasing any tell-tale signs in order to protect India’s image as a responsible regional power. In this case Manohar Parrikar’s statement is an indication that India may not be worried to take the blame anymore and is willing to raise the ante within the sub-conventional level of conflict. Or, simply put, India is not involved. After all, there are no known terrorist training camps in India and India closed its covert operation desk against Pakistan in 1997. The memory of assassination of its own Prime Minister Rajiv Gandhi in 1991 by LTTE, a militant group that had enjoyed some support from India is also fresh in the minds of Indian policy makers. Nurturing militants to pursue strategic objectives is a flawed concept, a fact that has been proven time and again. This brings us to the final point for consideration – if Pakistan is going through turmoil without India’s involvement, Pakistan’s security managers will have a hard time fighting the anti-establishment groups, if and when India actually decides to support them. The only thing then remains to be seen is India’s appetite to suffer the cost of retaliation. Hence, Manohar Parrikar’s statement should be a cause for concern for peace and stability in South Asia. However, if India’s aim is only to remind Pakistan of its own vulnerabilities in order to deter it from waging a proxy war in India, expressed implicitly in the defence minister’s statement, there may be a method to this madness.